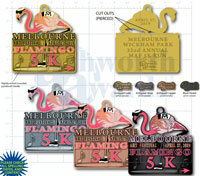 The 32nd Melbourne Art Festival 5K Flamingo Run will be held Saturday, April 27th starting at 7:30a.m. The 5K Flamingo Run is one of the largest 5K races in Brevard County and has established the reputation as one of the best executed and most fun runs in Central Florida. 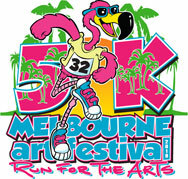 As the opening act for the annual Melbourne Art Festival (MAF), this premier event will host runners and walkers for the 32nd annual run. The proceeds from the race are used to promote and encourage artistic endeavors and education in Brevard County. Come join us for a great time and a great cause. Last year's best times and records are below. Recent times can be found at the links on this website. After the race, runners can enjoy a huge spread of mouth-watering treats including an array of fresh fruits, breads, juices, sandwiches, and all the bottled water you can drink as part of a spectacular post race celebration that is unequalled on the race circuit. For those daring runners, complimentary beer is also provided after the run. Included in the festivities will be a DJ playing everyone's favorite tunes and prize giveaways that are always a crowd pleaser. Awards are provided in 15 age categories as well as for overall, master, and team challenge (101 in total). $30 after April 19th and day of race. $20 by April19, 2019 for runners 9 and under or 65 and older. $25 after April 19, 2019 for runners 9 and under or 65 and older. Entry fees include the pre and post run festivities, your commemorative race shirt, guaranteed if registered by April 19, 2019, a souvenir race packet, and an incredible raffle of gift certificates and prizes for all runners while race results are tallied..
Race packet pick-up will be available at Running Zone on Friday, April 26th from 10am - 6:00pm. Given the number of runners, we highly suggest you visit Running Zone to pick up your race packet. Day of race registration & check-in for packet pick-up begins at 6:30 A.M. until about 7:20 A.M. This is a “can’t miss” event that fills up every year. Contact our Race Director with questions or to volunteer. Not a runner? Volunter and help with 2019 5K Run!